Chicken coconut curry with pineapple and green chilis, vegan beet burgers, vegetarian lasagna, Indian spiced lentils with braised cabbage, blanched kale, and honey roasted carrots. One of New York’s global cuisine restaurants? Nope. 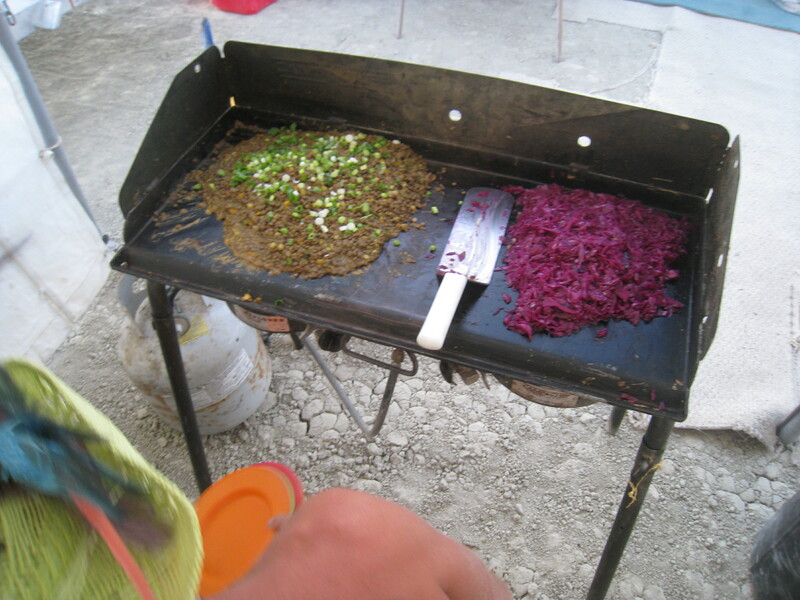 I ate this food in the middle of Black Rock City’s desert during the week long festival Burning Man. 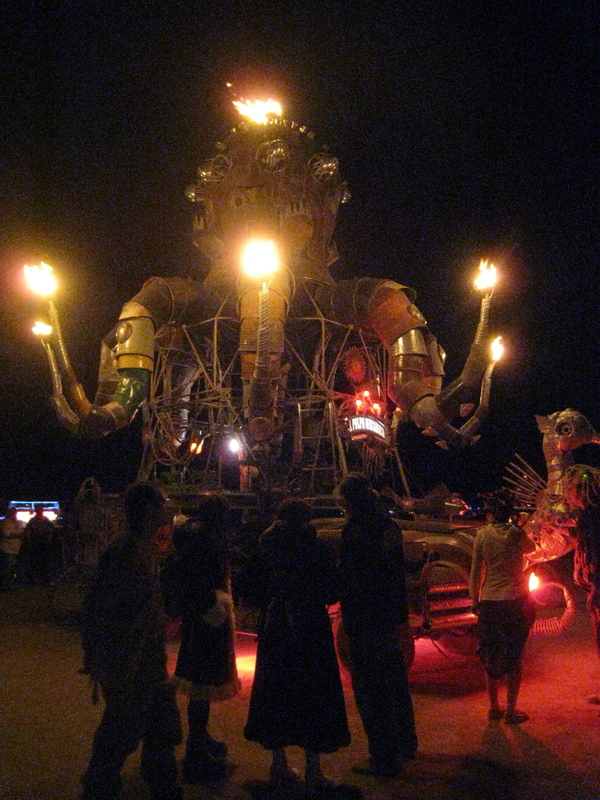 Burning Man is an event that heightens all your senses. It’s pretty much a Disneyland for adults. Neon lights, moving art cars, people self-decorated with L wire, installations that play eye tricks, and music that is so good and deep, with the base reverberating in your chest, that you can’t help but dance and explore until dawn. The desert art plays with your senses and tickles your brain. With the eyes, ear, and mind on sensory overload, it only makes sense to indulge the sense of taste as well. Many camps eat the way I ate the first time I attended this dusty, hot and sandy event: canned tuna, tasty bites straight out of the package, protein bars and crackers. But last year I camped with my sister’s friends, the Heathens, and their food program took my taste buds for a wild ride to match the rest of the sensory zinging that happens at Burning Man. I was utterly shocked when I sat down for the first family dinner. Packets of vacuum sealed and frozen bags had been slit open and warmed on a large griddle. Braised meats, perfectly seasoned greens, and bean stews filled our camp with aromas I’m only familiar with in some of New York’s finest kitchens. To eat like a king in the middle of a dust storm is truly an experience. Especially when other campers are biking by and wistfully peering into the camp, following their eyes and noses to the mounds of sizzling food bubbling away in our kitchen. At our camp, there is never a shortage nor rationing of food. We were over supplied, and towards the end of the week, we all started to eat several large meals a day, for want of not lugging home a freezer still heavy with food. Any excuse to open a bag and light the grill– stilt walking time requires fuel for the long walk to center camp! A hearty bite before we watch the burning of the Trojan horse! And of course we must eat loads of carbs and ice cream sandwiches before we make our way to the PB&J camp! 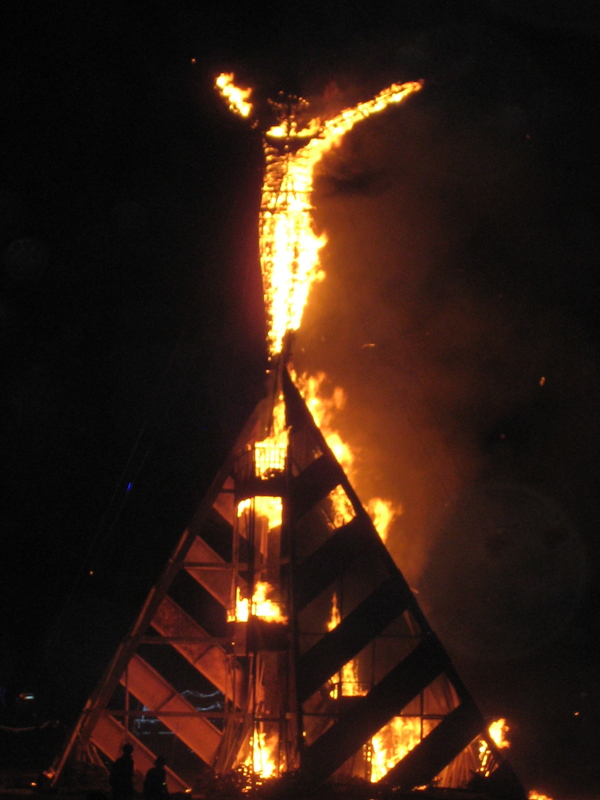 In my mind, I always think that Burning Man will be a week of slim to light eating, lots of bicycling and too much dancing and crafting. I’ll come home so much slimmer after a week in the desert! But alas, our leader and fantastic cook, Randolph Heathen, cooks too much delicious food and we all sit around several times a day, eating, pausing for a breather, sipping champagne and emergen-c….only to restart the cycle with another bag of lovingly prepared food that will surely warm our bellies and hearts. Oh wait. An art car tour in five minutes and then a DJ’d dance party in Dr. Bronner’s communal shower? I could almost pass it up to sit around with friends over a delicious meal. 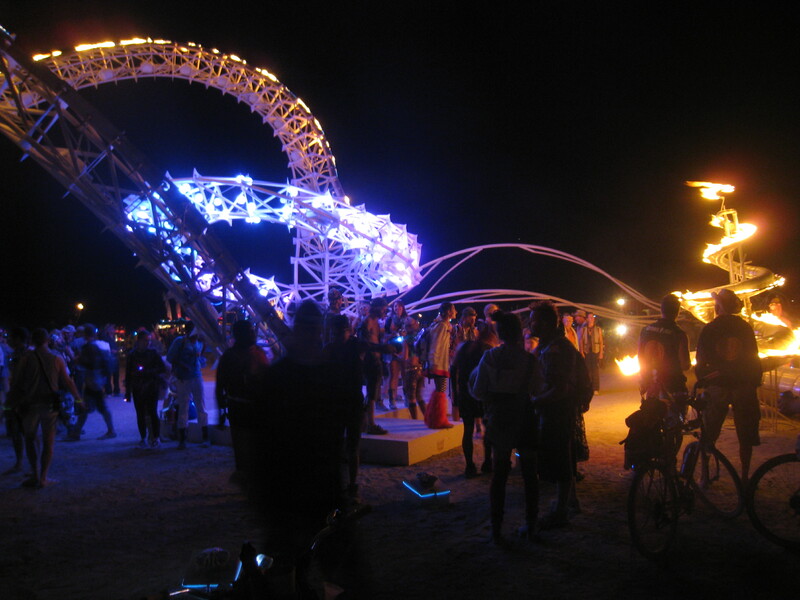 But then again…it is Burning Man, and anything goes. Eat and dance and make time for it all. Feed the fire, first in your tummy, and the rest will follow. Start planning the food portion at least a month ahead. Whenever you cook a meal at home, make extra. Vacuum seal the leftovers in a bag, label the contents and throw in the freezer. Too much food is better than too little! Great food options are braises and stews, beans and rice, curries, roasted vegetables, steamed yams, eggs in a carton, cereal and milk, and tea and coffee. Next Post Young Cooks, Head East! I must attend soooooon. Can anyone join your camp or is it already full. You know Jeff and I are totally fun. we can definitely discuss for next year! it is so much fun. you just have to be willing to be a heathen 😉 would love to see you two there! !